For Sale Times Square New Years Eve Painting, 16x20 in. 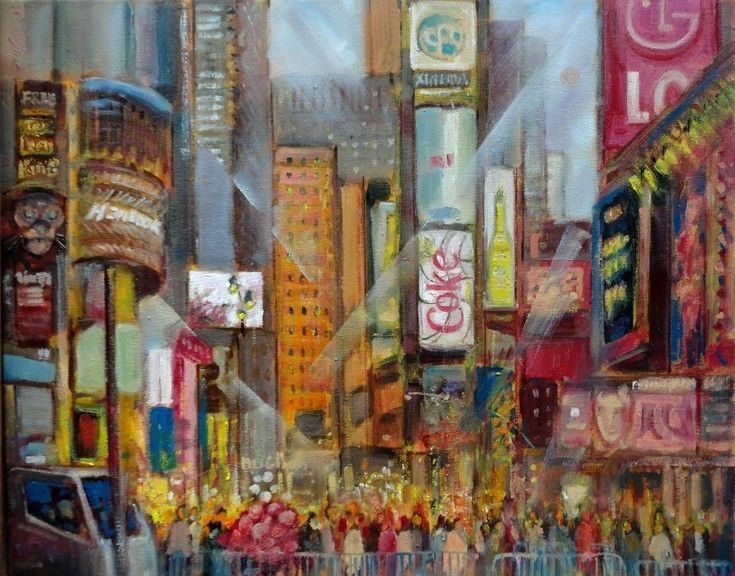 Times Square New Years Eve Painting, 16×20 in. This is an original oil painting on stretched canvas is of Times Square during the late evening in New York City. It’s painted in rich blue, gray, gold, red, yellow, orange, violet, gray and green tones. Rockefeller Center holds a universal fascination for New Yorkers and tourists alike. It’s fun to observe ice skaters although its probably more fun figure skating yourself —especially if you know how—I don’t. My interest is purely visual and it’s a year round place of stimulation for an artist. I find it better to just let the mind go with the flow and not be obsessed with one subject over another. After my college days at Syracuse University, I worked as a designer in an architectural office. Governor Nelson Rockefeller came in to meet with the designers and look over renderings of the proposed Albany Mall, Schools and Senior Living Complexes quite frequently. He was very unpretentious and approachable—hard not to like. Rockefeller Center reflects the enormity of the family fortune and is a beautiful contribution to our megalopolis. What fascinates me has nothing to do with the former governor. During the winter holidays and seeing the rows of trees lit up fascinates throngs of tourists although this particular scene of New York fails to give this artist the burning desire to paint. I became more interested in the rows of colorful banners snapping in the winter breeze. Behind them I portrayed the general feeling of lights, although non-specific. Strange how folks enjoy standing out in the frigid Center shivering while watching each other . Perhaps if you are from a part of the world where the population is sparse , this city offers an opportunity to “people watch.” For these folks who enjoy comparing their attire and body types with the multitude of pedestrians, forty second Street offers it all. New Year’s Eve brings the ultimate mass of humanities compressed in celebration each year. Most people I know would avoid this mundane form of recreation. It just isn’t safe anymore! The photographic reference based on times square provides me the opportunity to create many paintings of this popular area of the city. There are infinite subjects to paint in any direction you turn and it’s just plain fun painting Times Square—especially at night. I guess it’s all about reflections and contrast between flickering lights and stark silhouettes of sky scrapers where only window lights reveal their identity.